Students often mention to us they are confused about the rules of aromaticity and how best to study for difficult examples. 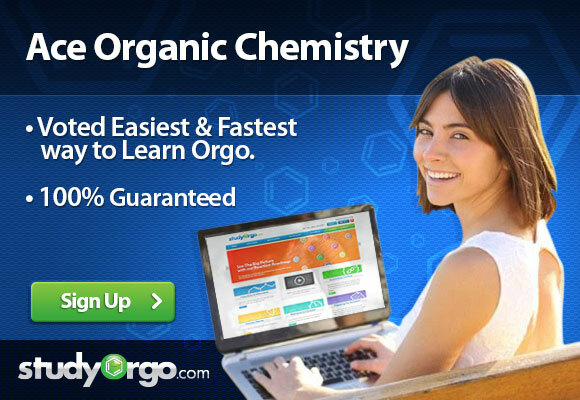 We at StudyOrgo.com have developed a clear and “get-to-the-point” presentation of the basics of aromaticity. This is just a sample of the clear-cut explanations available on our website to our members. Aromatic compounds are unusually STABLE and have important chemical and synthetic uses. In fact, nucleic acids and amino acids that make up every cell rely heavily on the use aromatic compounds. But, what makes a compound aromatic? A short list of rules, discovered by Eric Huckel in the 1930’s, lists the properties of aromatic compounds. But, anti-aromatic compounds have a closed loop of 4n pi-bond electrons. Below are the pi-orbital diagrams of benzene, the most identifiable aromatic compound. Each of the three double bonds contributes 2 pi-electrons over 6 atoms, for a total of 4*1+2=6 electrons, in a ring, in a pi-orbital that is planar. Therefore it is aromatic. In contrast, hexatriene meets all of these criteria as well, but is not in a closed ring. Hexatriene is therefore non-aromatic. Finally, cyclobutadiene is the most identifiable anti-aromatic compound which is different only in that it has 4*1=4 pi-electrons, in a ring, in a pi-orbital that is planar. The diversity of compounds relies on using atoms other than carbon, however. What about when atoms with lone pairs of electrons are involved? 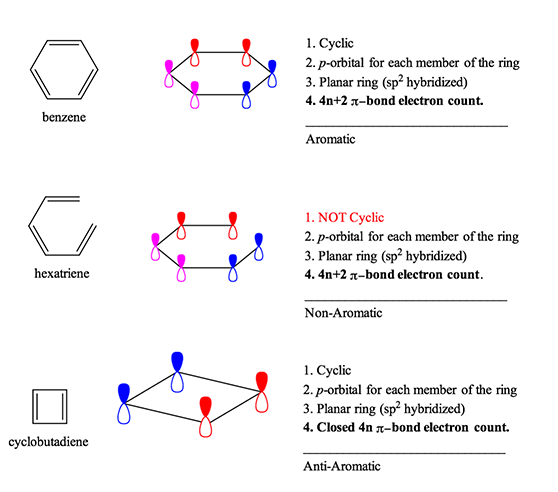 A good rule of thumb is that if the atom is already participating in the pi-bond forming in the ring, then the lone pair of electrons are perpendicular to the ring and therefore are NOT participating to aromaticity. A good example of this is pyrimidine, where both nitrogens are already contributing to the pi-bond ring and therefore, the lone pairs of electrons are not accessible. However, there are many molecules where lone pair DO participate to aromaticity. Below are several examples. Take furan for example; oxygen has two lone pairs of electrons. One of them is in a geometry parallel to the pi-bond system. Therefore, these electrons DO participate in the pi-bond system and add 2 electrons the pi-bond count resulting in 4*1+2=6 electrons, therefore furan is aromatic. 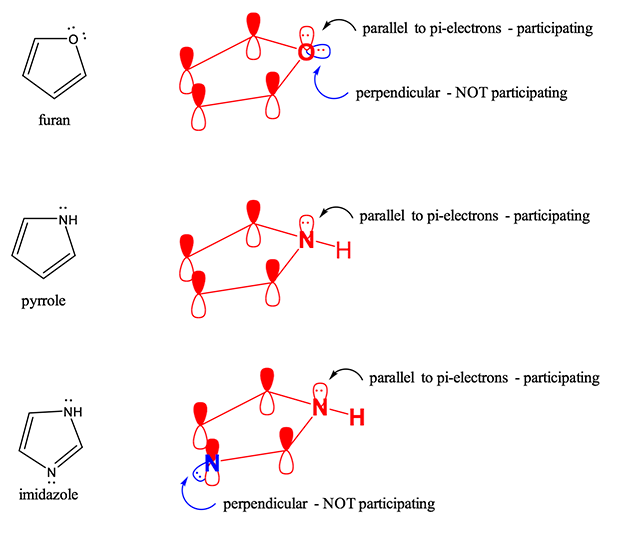 Imidiazole is molecule that has two nitrogen atoms; one nitrogen participating in pi-bonding and not contributing lone pairs, while the other is not participating in pi-bonding but contributes electrons the pi-bond count. The 4*1+2=6 electron count for imidazole renders it aromatic. Sometimes, carbocations and carbanions are produced in chemical reactions. If these species are created in a cyclic conjugated system, it is possible that they can contribute to the formation of a Huckel aromatic compound, which gives the molecule added stability and special reactivity. For example, cyclopentadiene is not aromatic because of the sp3 hybridized carbon at position 5 on the ring. However, in the presence of strong base, cyclopentadiene can be deprotonated and cyclopentadienyl anion is generated. 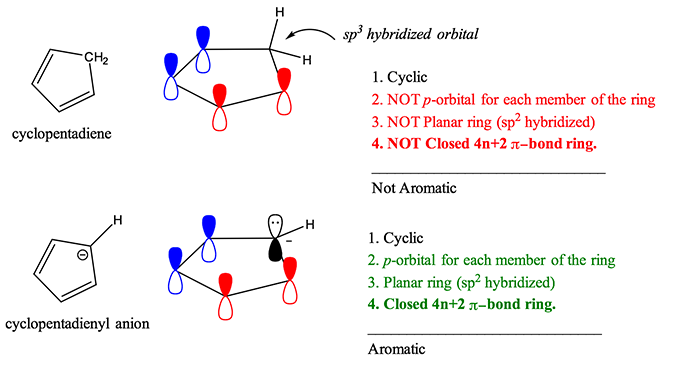 The lone pair of electrons assumes a sp2 hybridized orbital, making the molecule planar, adding 2 more electrons to the ring to give 4n+2 pi-electrons and creating the 5th pi orbital necessary to complete Huckel’s Rule and results in an aromatic ion. Another example is formation of a carbocation, a common intermediate in substitution and elimination reactions. Deprotonation of cycloheptatriene, a non-aromatic compound, at the sp3 hybridized position creates a sp2 hybridized orbital and, although this carbon’s pi-bond orbital is empty (a carbocation), it completes the 7th pi orbital necessary to complete the ring and maintains a 4n+2 electron count. This carbocation, called tropylium ion, is now aromatic.